Pssh, like anyone is going to use stealth. Maybe the team behind the latest Black Clover PS4/PC game should have developed One Piece World Seeker since their game is not going to be an anime fighter or a musou. Bandai even saving it for last. Who would be down for Tales of One Piece? look, when you remember how lazy OP game developers can be sometimes, there's no help but to be afraid that they are going to pull some dumb moves, like...remember when only Luffy was usable during Story Mode of PW1? or when in One Piece Gigant Battle I you couldn't play as Robin, Franky or Brook but just use them as Support characters? 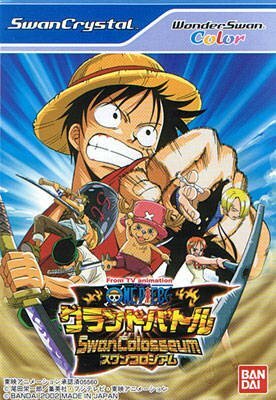 so when I read that this game supports only one player and that it's going to be from "Luffy's point of view" all this backstory comes to mind. Sure, it's waaaay to early to judge anything, but it isn't a promising start for the "dream game" of One Piece. Personally, I don't buy much into developers words, but this was such a setback that I was kinda shocked. Anyhow, waiting for more news. This suggestion in the Siliconera's article that you are a character linked to Luffy opens up the idea of customization, which is neat. Why was it wrong for me to I have unexptionally high expectations? but will it get nominated for best game this year? Like I and JC mentioned earlier you're expecting way too much out of this game for irrational reasons. One Piece being the best selling manga either in Japan/Asia or whatever doesn't mean it has to have a AAA title (nor win awards to) to legitimize it's quality. Nor is making a AAA title somehow going to boost it's popularity. if one single anime could get an AAA game, then it should be One Piece. Would require it to be published and developed by a studio that doesn't dabble in niche games. Bad enough to be apart of series that started originally on the PS2. And has fans who don't care about the games not being colorful or think that making a AAA title is somehow going to lead to a product that everyone can enjoy comparable to Call of Duty or Mario Games. Which is ironically one of things that I believe some people have been complaining about for no reason. That really wasn't URW's biggest problem feeling the need to rehash elements from the mangawhile at the same time trying to have an original story with a meh main Villain was. remember when only Luffy was usable during Story Mode of PW1? The only Japanese video game companies that are even trying to dabble in the AAA realm are Capcom and Square Enix. Bandai Namco mainly deals with mid-tier and AA games that target a niche market. As for the little bit of info on World Seeker, I appreciate the idea of giving us different options for certain scenarios in the game. Luffy and stealth seem like oil and water, but Luffy has shown to be capable of being stealthy when the opportunity calls for it. I would rather have devs try something new and experiment with different ways to approach gameplay than having the same beat em ups and fighting mechanics over and over again. I am very curious about non-Straw Hat characters in the game. I wonder if it will be like you have like Smoker being in that one Marine base, or a non-canon Marine introduced for this game instead? I know I was expecting too much, and these unreasonably high expectaions certainly led to a let down. I was just trying to explain why a had such expectations, and I believe everything I said is still in the realm of possibility (although maybe in the far far future). Bandai namco are actually one of my favorite developers, who created and keeps creating some of the creatively best games, they own titles like Tekken, Tales, Soul and many more, and I'm not talking about their various partners who offered game such as Dark souls 3, and don't forget the games developers who perivously partnered with them (like Koei Tecmo, and ubisoft) are capable of doing without their involvement. Popularity=Quality but yeah, I bought many of the Narutimate games on PS2, and I can't deny I enjoyed them (mainly for the multiplayer), but making the storm series the standard is a big no-no, the story mode apart from the good looking cutscenes is just a bunch of normal fights+QTE, and there's no denying that people realized how reptitive it became (thus the comparatively bad sales of Storm4). And you know what allowed CC2 back then to improve, it's because people allowed them to, I remember the first few Narutimate games not having that huge roster, yet people supported it, gave them the chance to make sequels, and here we are. On the other hand, people complained about burning blood having a "small" roster, despite being the first game (and probably the last) in its series. Also, with the burning of Mariejois having to do something with game story, the main villain will probably have a greater impact than Red. No, have you ever tried BotW. Zelda definitely create the new standard of Open World game. I would be satisfied with half of BotW from this game since it's One Piece. But if it can reach Zelda standard then it's good. Not so much fed up so much it's kind of overdone and in some instances simply not utilized very well. and don't forget the games developers who perivously partnered with them (like Koei Tecmo, and ubisoft) are capable of doing without their involvement. ....Koei Tecmo and Ubisoft don't develop games they publish them, and of the two only Ubisoft would be considered a Triple A publisher. Whereas Tecmo Koei are those guys only known releasing Dynasty Warriors and Dead Or Alive (yes they published Nioh as well though those are more established by comparison). On the other hand, people complained about burning blood having a "small" roster, despite being the first game (and probably the last) in its series. One Piece fighting games are generally one offs unless they have "Grand Battle" in the title. Actually, I'm pretty sure Team Ninja, Omega Force, Gust and Tecmo are subsidiaries that only develop games for Koei Tecmo, and I think Ubisoft works in a similar way. Look no further than One Piece Pirate Warriors series, this game was published by Bandai Namco, yet Koei Tecmo's logo shows up before you play the game, despite being "developed" by Omega Force. btw, It seems I made a mistake, I thought the xbox exclusive naruto games were published by Bandai Namco, guess I was wrong, it was published by Ubisoft itself. Did One Piece even have another fighting game? (apart from Fighting for One Piece which also tanked), I guess it's pretty safe to assume that if a One Piece game sold well, it is gonna get a sequel, Pirate warriors and Unlimited are series for a reason. Although judging from interviews, it seems the producer planned an open world game as soon as Burning blood was released. Although judging from interviews, it seems the producer planned an open world game as soon as Burning blood was released. Same Burning Blood during Unlimited World Red interview in 2014 hinting Aokiji moveset. Siliconera have some mods that are One Piece fans. I hope interview One Piece World Seeker the same way hinting the next One Piece game. Last edited by Wanted Sogeking; December 14th, 2017 at 02:35 PM. Yup and Capcom may be doing less since RE7 failed expectations wise and depending on how the likes of Monster Hunter World does. I hope the devs just do more with the combat, I like Unlimited Red but it's combat needs more to it than it's basic combos, especially if Luffy is only playable from the sounds of it. Tales games are like fast food mid tier RPG's, Namco ain't moving the teams off those games. I disagree because the Tales of are more than just RPG games. They also have fighting game elements. We haven't got any One Piece game focus on team party members fighting together against enemies nostop with so many different styles of team attacks. Bandai Namco in Dragon Ball FighterZ interview by Game Informer said they willing to work with any gaming studio even western developers to develop anime games as long as they fully know the series. So that statement about Bandai won't let the Tales of team to develop a One Piece game is load of crap. I can say the same thing for Ganbarion never going to develop a Dragon Ball, but they did and it's pretty decent. Sold well in Japan as it should. Spike was stuck developing Dragon Ball games for long and now they're free from it. J Stars Victory VS and One Piece Burning Blood may not be their best games, but it's still a start for them to try something new. They just need sequels. I personally think the developers of the Seven Deadly Sins game should have developed One Piece game instead Spike because they would add adventure/free roaming/RPG and fighting. It would be One Piece Burning Blood + One Piece Pirate Warriors. This way pleases every One Piece fan. No developer is limited to one game dude. Look up Sword Art Online Fatal Bullet, it's develop by Dimps and not Artdink this time. One day, I hope Dimps develops a One Piece game. Well it makes sense as you just mentioned Omega Force is a company owned by KT with BandaiNamco simply giving them permission to make those games as the own the video game rights to One Piece. It's important to keep in mind that developers alone aren't the key to whether a game is good. It's the director/team/talent behind the developer that matters the most.